Ana-Maria is 9 years old. She has a new born baby brother. Her family lives on Gibbs Green Estate. Because they are private tenants, they would be made homeless by the demolition scheme. On February 29, Ana-Maria and many other residents attended the Council’s drop-in session at the local hotel. Ana-Maria went into the lion’s den to ask councillor officers not to demolish her home, seen here. Watched over by Council security guards, she explains how she came to write a letter to the Governor (held by the officer in the blue shirt) on her own initiative. Her mother is filming the occasion on her mobile phone. I am writing to ask why you are knocking our houses down, in West Kensington Gibbs Green. I understand you want to make plant, cycle parking and things like that, but there are going to be lots of happy memories here. Instead of knocking our houses down just change the name of the area instead. It’s really sad for us because not only adults live here but babies, children and old age people. I know it’s until next year but, my mum has a new born baby, so where will we live and where am I going to play with my little brother? If you want to reply to my letter then send it into this address. I hope this letter has changed your mind about your plans. Thanks you for reading this letter. 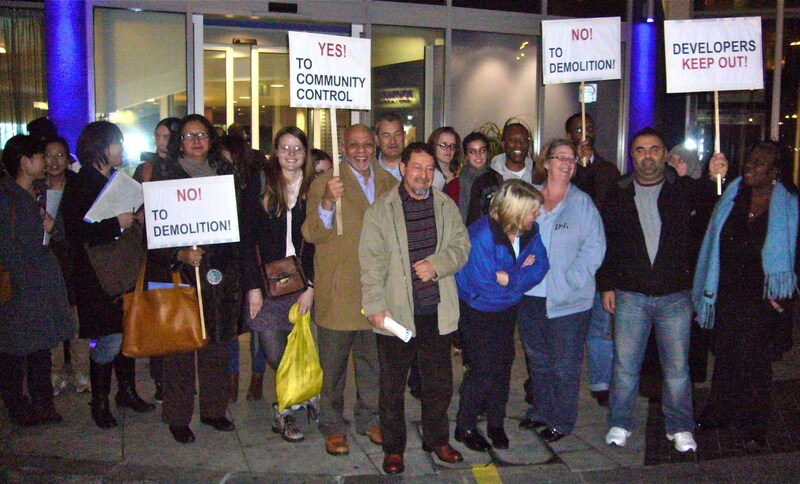 29 February 2012: Fighting for community control makes people happy! Residents can’t control their joy after dramatic closure of Councils drop-in session by 9 year old Ana-Maria. For more on this story, check out Philip Wolmuth’s story here as well as this report on the Shepherd’s Bush Blog.